"Who's Dying to Be a Gazillionaire?" In an attempt to save Planet Express from bankruptcy, Fry appears on a dangerous game show, where if he gets an incorrect answer, he will be killed. "Xmas Time Is Fear" Bender is recruited by the Robot Devil to tell everyone that Santa Claus has been reprogrammed to be nice this year. 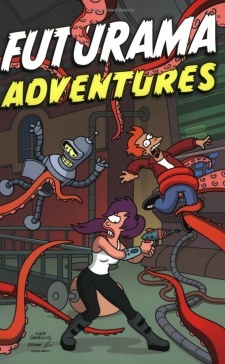 However, Bender, Fry, and Leela discover it's a hoax, and hurry to unveil the truth to the world. "New Year's Rockin' Evil" It's New Years Eve, and there's a blackout in New New York. To pass the time, the crew uses the What If? machine to see what would happen if Bender and Leela were sent back to 1999. "The Continuum Less Travelled" The Professor tests his new time machine. "Planet X-Press Men" The Planet Express crew gain superpowers. However, it is discovered the entire story is a dream by Fry, who was knocked out when aliens invaded the ship. "Freaky Fry-day" For Grand Nephew's Day, Fry buys himself and the Professor matching necklaces. That night, the necklaces cause Fry and the Professor to switch bodies. All five stories are written by Eric Rogers. "Monkey Sea, Monkey Doom!" • "...But Deliver Us to Evil!" • "The Owner of Mars Attacks!" • "DOOP the Right Thing!" • "Who's Dying to Be a Gazillionaire?" • "Xmas Time Is Fear" • "New Year's Rockin' Evil" • "Planet X-Press Men" • "Freaky Fry-day" • "The Big Sweep" • "The Cure for the Common Clod" • "Sideshow Fry" • "The Bender You Say" • "Six Characters in Search of a Story" • "Fry Me to the Moon" • "Kickin' It Old School" • "The Time Bender Trilogy:" (Part 1 • Part 2 • Part 3) • "Bender Breaks Out"
"More than a Filling!" • "A Fit Worse than Death" • "The A-Team" • "Twice Told Tales of Interest" • "Robot Robin Hood" • "A Whole Lotta Leela" • "Rotten to the Core" • "Let's Twist Again" • "Downsized!" 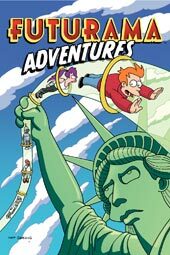 • "Fry and the Double-Bag Must-Have Item" • "As the Wormhole Turns" • "Doctor What" • "Attack of the 50-ft Amy" • "Planet Michelle" • "Son of the Sun" • "You Don't Wanna Know Jak!" • "Full Metal Racket" • "Rumble in the Jungle" • "Rust in Peace" • "Robot Santa's Little Helpers"
"Soldier Boys" • "Homeward Boned" • "Welcome to my Nightmall" • "The Fry and the Furious!" • "Anthology of Interest II" • "Follow the Reader" • "Chitty Chitty Bend Bend" • "Claw and Order" • "Dummy Up!" • "Your Mother Wears Pilot Boots" • "Fry Cook!" • "Ro-Botox!" • "A Bump in the Flight" • "How Much is that Mutant in the Window?" • "The Trouble With Trilogies" • "Do You Want Fry with That?" • "Steampunk'd" • "Boomsday!" • "How to Secede Without Really Trying" • "The Bot Who Cried Wolf"
"Troop Grit" • "Lost Our Leela" • "Igner-Ance is Bliss!" • "Secret Santa" • "The Sun Also Raises!" • "The Board Game Games" • "Tartar House Five" • "Futuramarutuf" • "Don't Go Taking my Heart!" • "The Devil and Professor F." • "Pizza Wars" • "Trading Spaces" • "Night of the Automated Dead" • "What the What if?" • "Bendership Galactica" • "Captain Brannigan: The Windbag Soldier" • "New New New York" • "Little Orphan Android" • "Kif of Death!" • "Dumbsday!" "Somewhere Over the Brain-bow!" • "Liquid Diamond Is Forever!" • "Slaves of New New York!" • "The Read Menace!" "H.G. Blob in Revenge of the Blob" • "The Continuum Less Travelled" • "Leela & Amy in Hostile Makeover" • "Captain Zapp Brannigan in The Seven Day Itch" • "Captain Zapp Brannigan in Purple Tentacle Tour" • "Captain Zapp Brannigan in Rank Call!" • "Zoidberg Makes a House Call" • "H.G. Blob in A Funny Feeling in my Tummy" • "Breaking News"
Futurama-O-Rama • Futurama Adventures • Futurama: The Time Bender Trilogy • Futurama Conquers The Universe • The Simpsons Futurama Crossover Crisis • Futurama Comics: To Infinity! "Monkey Sea, Monkey Doom!" • "Futurama Returns" • "Delivery-Boy Man"
This page was last edited on 17 August 2013, at 23:06.